Economic Partnership Agreements: Will Europe Africa Avoid a Diplomatic Tragedy? 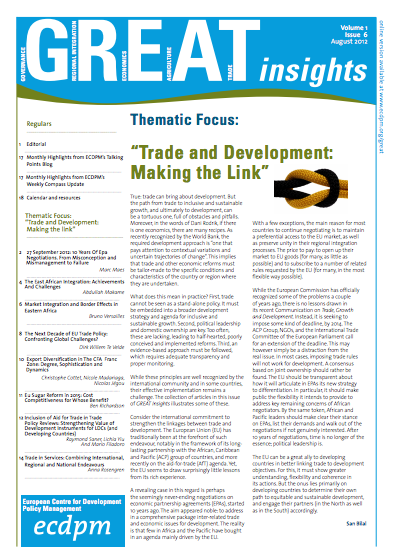 ECDPMGreat Insights magazineEconomic Partnership Agreements: Will Europe and Africa Avoid a Diplomatic Tragedy? Bilal, S., Ramdoo, I. 2013. Economic Partnership Agreements: Will Europe and Africa avoid a diplomatic tragedy? GREAT Insights, Volume 2, Issue 8. November 2013. Maastricht: ECDPM. 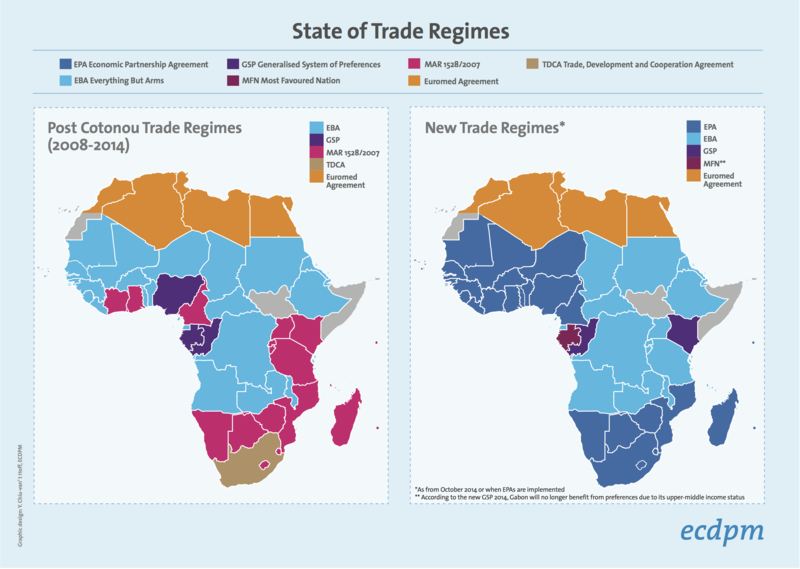 Failure to immediately identify compromises on the trade talks towards regional free trade agreements between African regions and the European Union (EU) could derail the Africa-EU Summit in April 2014 and jeopardize the partnership. If the Economic Partnership Agreements (EPAs) are not finalised well before the October 2014 deadline set by the EU (see Box 1), it will mean that many African countries will lose some or all of their preferential access to the European market. This would be unprecedented. More importantly, the risk of serious trade disruption might lead some countries to agree to individual trade deals with the EU, splitting away from their regional grouping. In the case of customs unions, with common trade policy, this would mean the end of the regional economic integration process. This is a potential outcome, for instance with Cote d’Ivoire and Ghana in West Africa, Cameroon in Central Africa, Namibia and Botswana in Southern Africa, and Kenya in East Africa (see Box 2). For the time being, all have pledged regional unity despite attempts in 2007 to preserve national interests by initialling individual trade deals with the EU amidst the expiry of the waiver granted by the World Trade Organization (WTO). But when it comes to crunch time, tensions will flare up once again should regional agreements not be in sight. For the sake of illustration, consider the case of the Economic Community of West African States (ECOWAS), where after an over three-decade long process, Heads of States have just approved a single customs regime from 2015 (1). And on 29th October, the EU Commissioner for development, Andris Piebalgs, announced €6.4 billion in support of West African development, €1.2 billion of which would go to regional programmes, for the period 2014-2020 (2). However, if the EPAs are not dealt with, then this economic regional integration could break down and result in the de facto collapse of the customs union, as well as wasting billions of euros in EU regional support to West Africa. Preserving regional unity is therefore a priority. While this is first and foremost an issue for African leaders in their respective regions, the EU should not turn a blind eye to this challenge or be perceived to foster division. As a major supporter of regional integration in Africa, the EU would have much to lose as well, not least in terms of accountability, coherence and credibility. 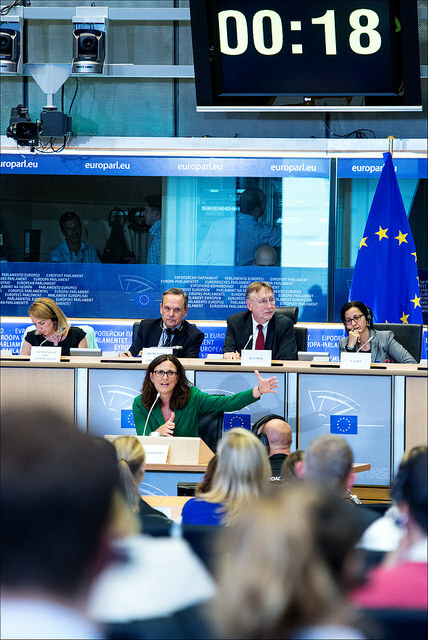 Instead, the EU should consider to which extent some of the remaining concerns in the EPA negotiations could be addressed in a more flexible manner. So far, EPA negotiations have generally been captured by expert negotiators who have attempted to address technical issues on a case-by-case basis. But it has failed to crack the nut. It is now time to step up a higher political engagement: remaining stumbling blocks should be dealt with in a more accommodating way by trade diplomats under the guidance of European and African leaders, and political implications should be openly addressed, notably at the 2014 Africa-EU Summit. The best way to succeed is to prepare for the worst! Leaders should assess the costs of failure to conclude regional EPAs on time, for themselves, their economic actors, African regions and Africa-Europe relations. If common sense prevails, this should translate into politically acceptable trade compromises and commitments. This should not be difficult, as most technical solutions have been explored inside and out. In West and Central Africa, some more flexibility is needed concerning the degree of liberalisation of access to African markets (e.g. 70%-75% instead of the 80% requested by the EU) and possibly longer transition period (beyond 15-years). The EU’s request to African countries to eliminate export taxes should be solved in a pragmatic fashion, with a WTO-compatible language, which limits export taxes to specific exceptional economic conditions, and subject to a consultation process between the parties. The EU requests a “most favoured nation” (MFN) clause, whereby preferences granted to major third parties would be extended to the other parties of an EPA. Flexible wording should be identified, relative, for instance, to non-automaticity and consultation, and the scope of the clause broadened (e.g. extending to African regions full cumulation in rules of origin as granted to EUROMED countries). To address implementation and adjustment costs of an EPA, ‘additional funding’ should be mobilised, through Aid for Trade, regional support and in particular using innovative financing modalities such as blending loans and grants, to be delivered through existing or new mechanisms. But this is no guarantee for success: differences may narrow (as they already have done over the past months), but remain deep enough to prevent an agreement from being concluded on time. Nonetheless, meeting some of the partners’ concerns would certainly increase the chances of success and provide a positive political signal of goodwill. Should this prove insufficient, parties should then agree to disagree, and prepare for a ‘smooth landing’. Maintaining regional unity should remain the priority. The EU and African regions might then engage on constructive talks on how best to address the consequences of the loss of preferences for some countries that would embrace a collective decision by their regional grouping not to conclude any EPA. A similar approach towards constructive engagement should prevail if some African countries ultimately opt to break away from a regional position and proceed with individual EPAs. A note of caution is required when considering the 1st October 2014 deadline. This implies that on that date, an EPA will have to be fully in place, that is, that the agreement will have to be concluded, signed and the process of ratification started. Unlike the situation that prevailed with the 31st December 2007 deadline, the EU will no longer unilaterally provide full market access to countries that have simply concluded EPA negotiations. the start of the ratification process. Should some regions not be able to complete all these steps on time, they will not be able to export to the EU under an EPA. Countries having concluded an interim EPA in 2007 will lose their EPA preferential market access to the EU, unless they take all the steps to implement their interim EPAs. But this is most unlikely should regional EPA negotiations progress well, or be concluded. In fact, it would not be politically acceptable for any government to sign an old (controversial) interim EPA and send it to its national parliament for ratification while a regional EPA is near completion or already concluded. How to address temporary loss of preferences during this transition period is thus likely to become a hot issue in 2014. This will also call for a political approach towards technical solution to avoid an absurd temporary loss of preference. 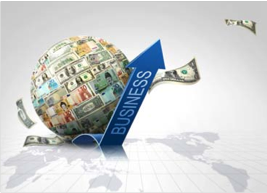 The economic partnership agreements (EPAs) are meant to be development-focused comprehensive reciprocal free trade and economic agreements, negotiated and whenever possible concluded by the European Union (EU) on a regional basis with African, Caribbean and Pacific (ACP) countries. They were meant to replace the EU unilateral trade preferences for the ACP initiated under the framework of successive Lomé Conventions and extended until the end of 2007 under the Cotonou Agreement, which required a waiver at the World Trade Organization (WTO). The EPA negotiations were initiated in 2002. By the end of 2007, only 36 ACP countries had concluded EPAs with the EU. With the exception of the Caribbean, all agreements were interim free trade agreements concluded to preserve the market access of these countries to the EU. 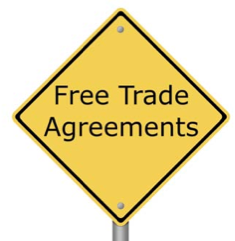 Under Market Access Regulation (MAR) 1528 of 1st January 2008, the EU granted duty-free quota-free market access to the all the exports from EPA countries. Since 2008, the other ACP countries have been exporting to the EU under the Generalised System of Preferences (GSP), which provides duty-free quota-free market access to exports from least developed countries (LDCs) under the Everything-But-Arms (EBA) initiative. 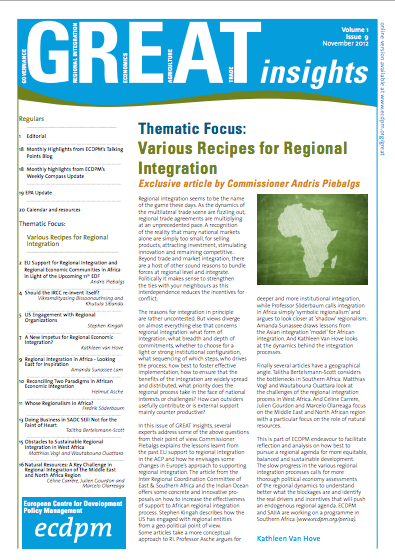 EPA negotiations have continued with all African regions and the Pacific, with a view to conclude regional agreements. 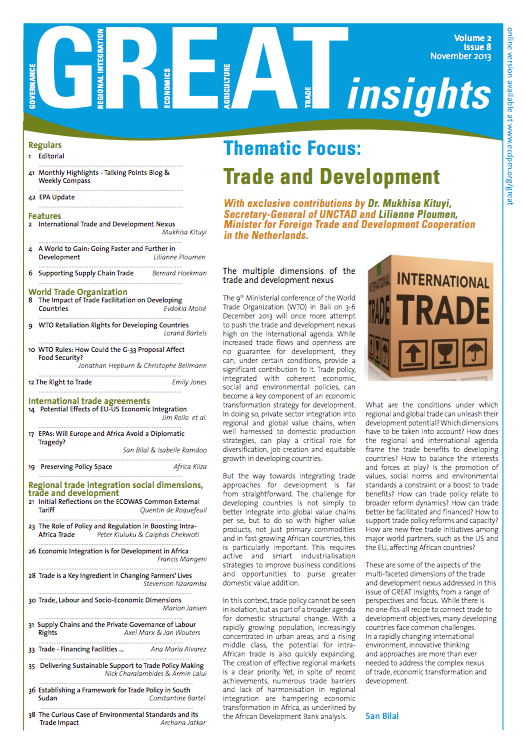 The EU has given African and Pacific countries until 1st October 2014 to complete new trade agreements between the two, or ratify existing ones, if they do not want their exports to risk facing higher restrictions to the European market. Dr San Bilal and Isabelle Ramdoo are respectively Head and Deputy Head of the Economic Transformation and Trade Programme at ECDPM. San Bilal is also the editor of GREAT Insights. 1. See http://uk.reuters.com/article/2013/10/25/uk-africa-west-tariff-idUKBRE99O10M20131025 and article by Quentin de Roquefeuil in this issue of GREAT Insights.